Keep sharing, this is fun. good work Adam and Luka. Frac love and banana love ---- I like 'em! 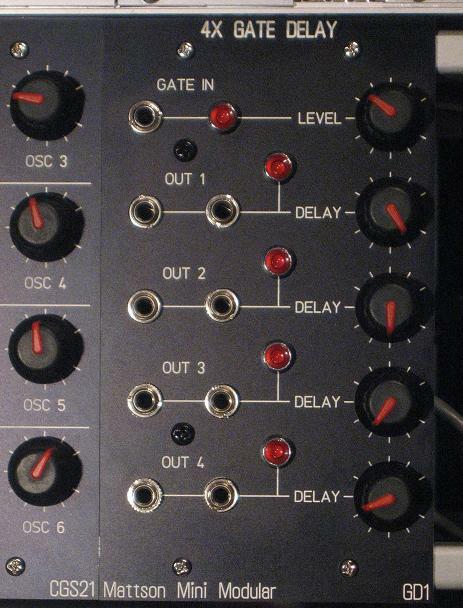 They all look like fantastically useful modules -- especially liking the look of the Quad Gate Delay -- yum! really bad pic, but i squeezed the VCF and AF1 each on a 6HP euro panel width. i wanted to try and keep the MINI part of MMM alive in euro. knobs are temp and i haven't installed the LEDs for the AF1, but you get the idea. im still trying to figure out what knobs - they need to be small. the only thing is that bandpass on the VCF is noticeably lower in audio level: see here for audio example. Finger grease AND big knobs -a winning combination! Do you get much flex on the acrylic panels? Here's my Squiggletronics edition of the MMM State Variable Filter! Works great! Blue acrylic panel from Pro-Modular with a bit of white spray paint. Ooops. Those are gifs. I'll fix it later. WOW! BananaPlug, your panel assembled came out GREAT! 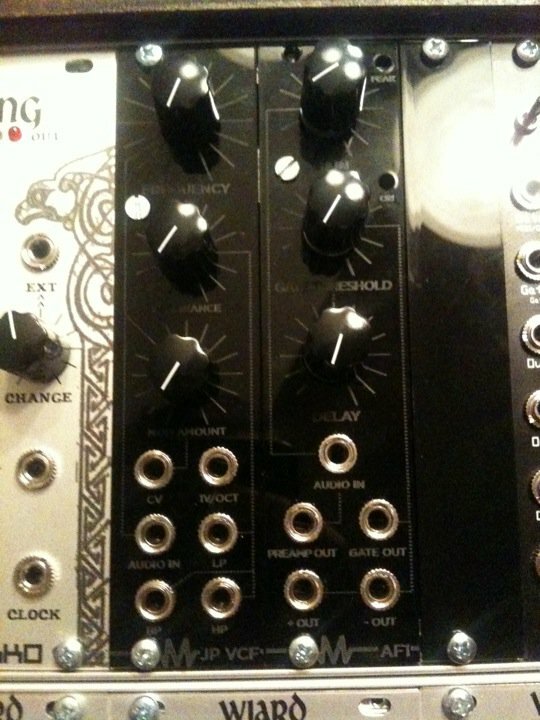 WAY better with these knobs. 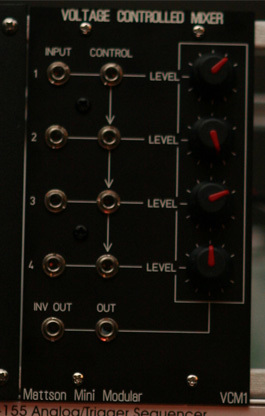 Here's my Squiggletronics edition of the MMM VC Mixer! 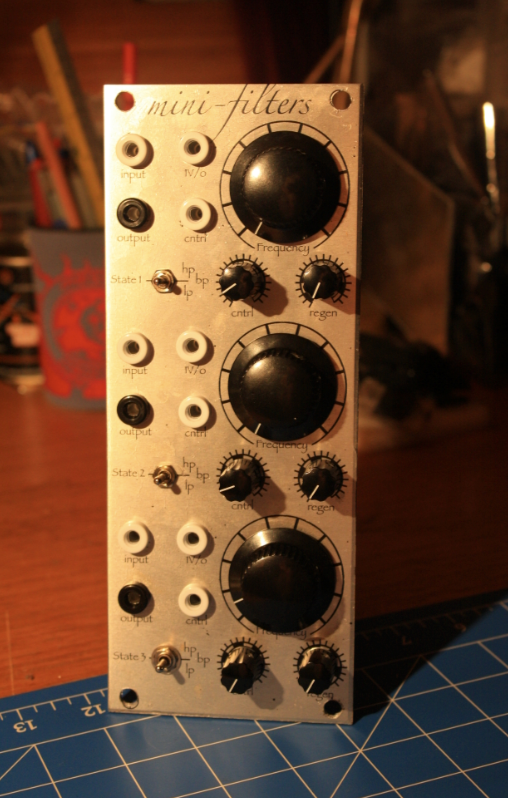 This is now the output module for my small Frankensynth (about 19" square). It was not easy cramming this into a 1.5" wide frac module! If I'd done something like wire all the pots backwards I would have been really pissed. The four pots are pull pots. 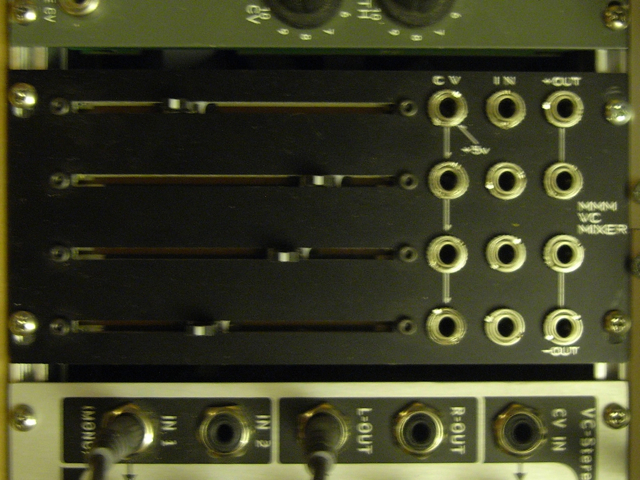 Pull the pot and a 5V source is substituted for the signal from that channel's CV input jack. 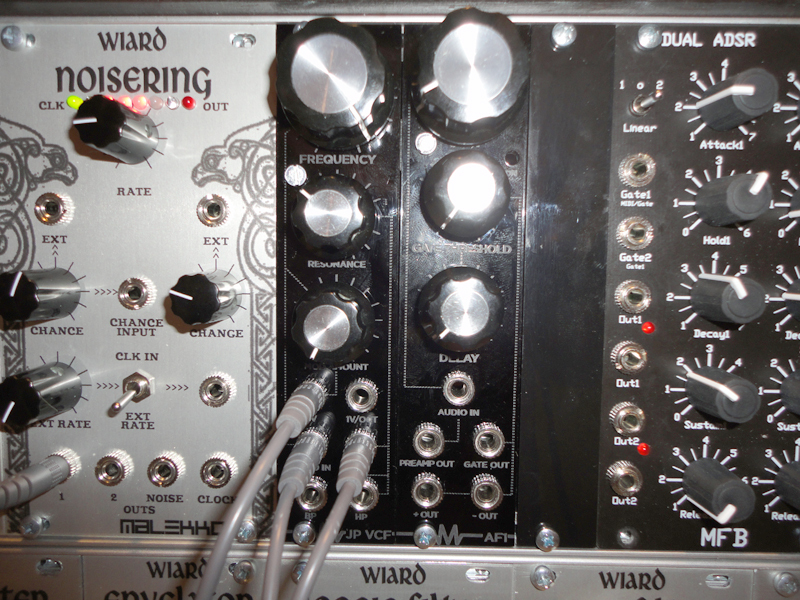 This makes it behave exactly like a channel of a manual mixer. The little hole above the output jack is a recessed mini jack, same signal. 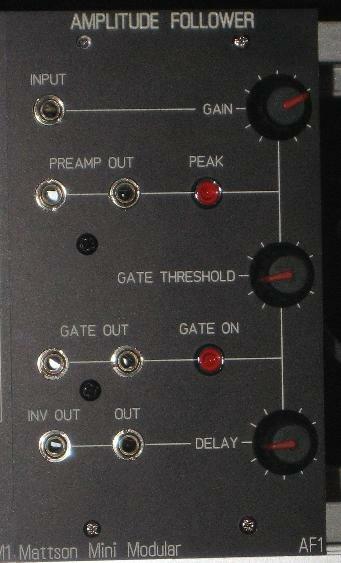 Panel laser cut by Pro-Modular just like the filter a few posts back. Nice one. I thought I was good at squeezing functionality into small spaces! I've been looking for pull-switch pots. Got a part number? Bananaplug stuff looks great. Classy all the way. This will work great with the Mattson Quad EG I am building. I'm going to use the pull pots to switch between AD and AR mode. an old and crappy pic, sorry!